One of my issues with contemporary abstract art is that there is too much time devoted to young artists who are guilty of simply splashing their paintings with lashings of any exotic colour they can get their hands on, and not enough platitudes and praise offered to abstractionists who indulge us with their calculated ways of working. Whilst some go for the big, bold, eye-catching abstractions that grab the headlines, those who opt for the unassuming but intelligent method find their work largely ignored. I’m not saying there is something wrong with any way of working and expressing oneself, but sometimes you want to see contemporary abstraction where the artist has seriously considered and calculated his creation – just like in the old days where Mondrian would spend five years working on a single painting before spilling a bit of paint and starting again. For this, we can look to Jon Thompson, a now dyed-in-the-wool abstractionist who recently exhibited at the Anthony Reynolds Gallery in London late in 2014. 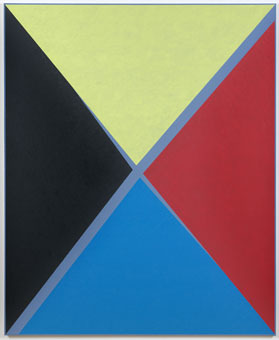 Born in 1936, it’s easy to forget about Thompson and his minimal geometric abstract art because he drifts in and out of the art world so quietly. The problem for me is that, not only do people forget about his art, they also choose to ignore it. Perhaps because Jon Thompson is better known as a critic, an educationalist and a curator, his actual works of art have gone unnoticed. Or perhaps it’s because he isn’t given to the kind of ludicrous self promotion that characterises a great portion of the modern art world. Thompson hasn’t always been an abstractionist, with a lot of his career devoted to photography and sculpture. 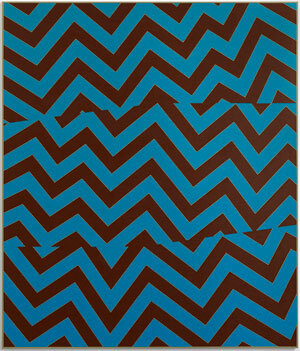 But colour fields and geometrical shapes make up the basis of his latest exhibition, entitled The Lyotard Suite. What I like about Thompson’s work is that, despite its thoughtfulness and exactitude, there is nothing stable or geometrically perfect about it. It’s inherently unstable. 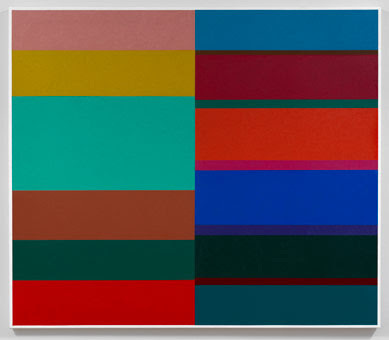 Radical forms conflict, extreme tones and colours collide, with Thompson eschewing any theoretical notions about the idea of saddling complementary colours with one another in favour of creating a sort of optical illusion that isn’t jarring but just curious. Moreover, it’s peaceful and still. It’s what art galleries were made for. The Lyotard Suite is about as good as it gets right now for contemporary minimal art. For anyone who believed that colour theory ended when Josef Albers went down with the Bauhaus before the Second World War, I’d advise you to check out Thompson’s work. He quietly and unassumingly builds colour tonalities, with the spectator feeling drawn in precisely because of the canvases unassuming nature. There is nothing spectacular here; nothing ridiculously eye-catching. It’s just gloriously understated, but once you’ve been drawn in, you probably won’t want to leave for a while.